Shop assistants have no sense of humour. If they insist on stocking and re-stocking the shelves with every Doctor Who toy on the market, they have to expect people to press every button on every toy until the shop sounds like there is a war going on between Daleks, Cybermen and K9s while a million TARDISes take off and land. I’ve done it. I’ve bought a new TV. A new flat panel TV. Despite the wiser voices of others I could hold out no longer. It actually happened a couple of weeks ago but I wanted to wait to see real HD content on the panel before making any public statements! True HD pictures look excellent. Back to the beginning of the story, though. A couple of weeks ago (on a Thursday – I never could get the hang of them either) I found myself in the centre of London on business. As I was finishing up and about to make my way back to Victoria, I paused. Should I quickly nip to Tottenham Court Road to see if they have this fabled new Sharp LCD panel in? I’d read reports it had already appeared in Harrods (but apparently the feed wasn’t very good there, one reason I wanted to avoid the place). The electronics shops would be a better bet, all around. In the end, I decided I’d rather go home, get the weight off my feet and have some dinner. The following day, however, I stopped by the local Comet Superstore over lunch. Without warning the Sharp LCD panel in question appeared on display! Almost equally as if by magic a shop keeper also appeared. Was I dreaming? Apparently not. The price was a few hundred more than I knew I could get it online. Nonetheless I managed to get some information from the salesman (and looked over his shoulder to see the computer saying they only had three in stock). A tad expensive. I made vague suggestions I might return on the Sunday to buy one and left. Back in my office I phoned up the people who recently supplied my upscaling DVD recorder, AV Sales. Their website said they still didn’t have any in stock. Talking to them on the phone revealed that the preorder queue was quite large, their supply trickling in very slowly indeed and I was unlikely to see one before Christmas. There went my preferred supplier. Over ‘Beer and Skittles’ at the end of Friday afternoon (when somebody at work goes out to get some snacks and we all spend the last hour of the week having a little party!) I decided. Those vague promises about going back to Comets to buy the panel, that I hadn’t intended to keep, would be kept. I wouldn’t wait until Sunday though. Not even until Saturday morning. I’d buy it on the way home. And so I did. The 46″ panel filled the back of my little car. The only problem was – it was far too bulky for one person to offload. I needed help and Macfadyan was close by. A quick drive down the road from my place to his car park, a mobile phone call (not leaving the expensive equipment unattended) and help I had. The best part of the next hour saw us unpacking (totally failing to discover the easy way to unpack the large panel…) and my attempts to plumb it in to my myriad of AV equipment in the TV Room. Success! A big thank you to Macfadyan – not so much as a scratch on the set. To be honest the first pictures on it were disappointing. Standard Definition pictures from the built-in Freeview decoder. Trying a DVD, using a SCART lead, proved a little better but still not wonderful. It wasn’t until the following day, with a shiny new HDMI cable (roughly the new, HD ready, equivalent of a SCART cable) that things really improved. Finally some pseudo High Definition images, upscaled by the DVD player to 1920x1080i (rather than 720x576i). A big improvement but could do better. I needed real HD. It is only as of this past Saturday morning that I finally have seen true HD on the panel, thanks to a Telewest TV Drive. Torchwood in HD. Robin Hood in HD. Even Space 1999 in HD (yes, really – on ITV HD, they must have gone back to the original film and rescanned/remastered it for HD). They all looked excellent. That’s the future. It’s just a shame there isn’t more HD content yet. Still, as an added bonus, the TV Drive also does some upscaling magic to SD pictures in the same way my new DVD recorder does. I will say this, though. Flat panel TVs, especially Full HD ones, probably aren’t really there yet for the average Bloggs on the street. Decent sized flat panels really show the flaws with SD material. If you haven’t got HD content (and almost nobody does yet on these shores) then take the advice I ignored and wait. I’m not in the least bit sorry I didn’t, I really get that cinema experience. It didn’t come cheap though and I will have to continue paying for the luxury of HD content every month. If, like me, you must be a foot in the future then join me. Otherwise wait a couple of years. 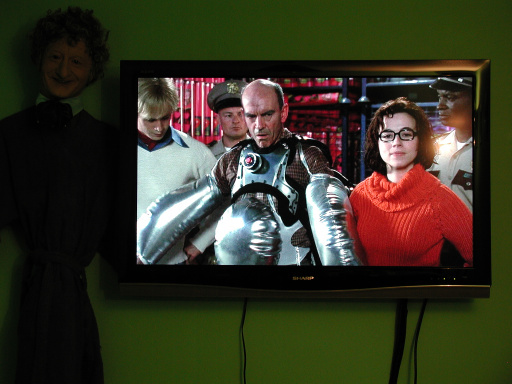 Ultimately you’ll all overtake me long before I will swap this TV for another! The Return of…Local Radio Man!!!!! Local Radio Man is back! His interview with the lil kiddies was classic eighties Local Radio and his interview with David Tennant consisted of trying to a) get Tennant to speak in a Welsh accent and B) Ruggedly trying to get Billie Piper’s phone number. His main concern, to be honest, was explaining that his suit (from Debenham’s, apparently) was bought BEFORE the tenth Doctor was revealed. Pure nostalgia, listening to this chap…and indeed, the whole shebang cos frankly, the BBC Radio Wales presenting team are worth their weight in Gold…..
note..its now, apparently, pronounced Sy-COR-ax…which is nice….Ill keep you posted as to what other howlers these guys come out with…. I will not be influenced!!! I have discovered a drawback to raising kids in a ‘we love sci-fi’ environment. While Eldest Boy has found his own likes and dislikes and is pretty much indifferent to the genre, Youngest Boy is so much like his dad it’s frightening. And today, when told ‘no, we can’t put the Christmas decorations up now’ proceeded to use his Jedi Mind Trick to persuade me to change my mind. I give up, I really do!!! 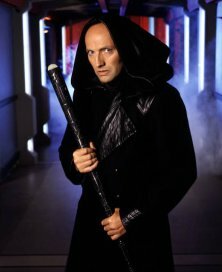 Back in August I first mentioned this new Babylon 5 project and, thankfully, it has gotten somewhere – unlike the failed attempt to make a feature film a couple of years back or so. Ain’t it Cool News has the full press release from Warner Home Video and JMS News compiles JMS’s newsgroup postings, including an explanation on what to expect with the first disc or so. 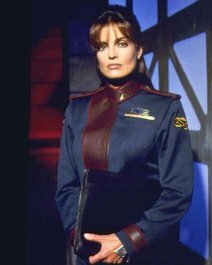 Yes, Bruce Boxleitner, Tracy Scoggins and Peter Woodward are reprising their B5 roles (and, of course, Crusade for both Scoggins and Woodward). 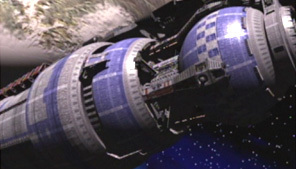 JMS as writer/director/producer, along with the return of B5’s Doug Netter as Executive Producer again. B5’s Chris Franke will be writing the music. No word on returning themes yet, though. The first disc is concentrating on the Human characters while they get their prosthetics and effects back up to speed. Originally there were to be 3 half hour stories on the first disc but a Garibaldi story has been held over to, hopefully, the second disc as the “Garibaldi story was the most complicated visually and technically, also the most difficult from a CGI perspective”, according to JMS. The other two were increased in length to make up for the loss. 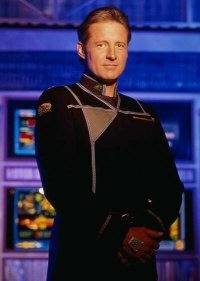 From the Warner’s Press Release: “The story of The Lost Tales picks up several years after the events of its original story, and follows several of its major characters in new adventures set against the backdrop of the Babylon 5 universe.” I presume that means before Sleeping in Light, however! If the first disc sells well then we should see more. You all know what you’ll be getting for your next birthday present! The format is likely to remain as three half hour stories per disc, each story concentrating on a B5 character. Let’s just hope the rest from B5 that JMS has had means we don’t get another Legend of the Rangers… I’m confident. Fairly confident!